SAINT-OMER, France – In a bright space that used to be a chapel for the College of English Jesuits here, 12 larger-than-life portraits hung along the side, representing students from a bygone era. The official opening of the Chapel of the Jesuits as a new arts and performing space for the town of Saint-Omer in northern France harkened back to the early days of the school, which opened in the 16th century, when Catholic worship was banned in England. The chapel’s re-opening to the public, after a four-year renovation, was a cooperative effort between the town of Saint-Omer and the United States, especially the state of Maryland. The Oct. 14 opening marked the 275th anniversary of the arrival at the English College by Daniel Carroll in 1742. Daniel’s brother John and cousin Charles followed the path to Saint-Omer in 1748. All were about 12 or 13 years old when they arrived at the school. Daniel Carroll of Rock Creek, born in 1730, one of only five people who signed both the Articles of Confederation and the U.S. Constitution, first arrived at the College of English Jesuits in 1742 and studied there for six years. John Carroll (b. 1735) and Charles Carroll of Carrolton (b. 1737), arrived at Saint-Omer in 1748. Inspired by the Jesuits teaching at the school, John joined the order, became a priest, and eventually was named the first bishop in the United States in 1789 when the Diocese of Baltimore covered the original 13 colonies. Charles was the only Catholic to sign the Declaration of Independence. The portraits, approximately 40 feet tall, showed present-day students and faculty members – from Saint-Omer’s Ribot High School, Georgetown University in Washington and Harvard University in Massachusetts – in clothing and hairstyles that would have been typical of the mid-1700s. Bishop John Carroll founded Georgetown University. Photographer Sacha Goldberger selected the library that was attached to the school as the backdrop for the photos of 10 students and two faculty members. The library’s old, wooden shelves with books dating back centuries, including a copy of the Gutenberg Bible, fit well with the stark, black robes. Architect Pierre Antoine Gatier, who designed the chapel renovation, found through his research that the walls of the space, which had not been used as a chapel since the time of the French Revolution in the 1790s, had originally been bright white, so he reproduced that effect. In past decades, the space served as a horse stable, a warehouse for wartime aircraft parts and a parking garage. Gatier kept some touches of color on the high walls of the apse. The windows are generally light colored, with the architect noting that they don’t know what the stained glass looked like in the Jesuits’ time. The chapel was originally built in 1629. Dignitaries from the region and across the sea came for the official opening of the Chapel of the Jesuits, including Baltimore Archbishop William E. Lori, 15th successor of Archbishop John Carroll; Maryland Lt. Gov. Boyd K. Rutherford; and Maryland Secretary of State John C. Wobensmith. Descendants of Daniel and Charles Carroll also attended. In remarks at the opening, Rutherford noted that the Carrolls were not just founding fathers of the United States, but also of Maryland, because Daniel was one of the first members of the state senate, John was the first bishop of Baltimore and Charles was Maryland’s first U.S. senator. Noting that Charles Carroll supported the American Revolution and General George Washington himself, the lieutenant governor said, “Seeing the persecution of his faith, not just in Europe but in fledgling America, he fought to protect and ensure religious freedom for a country yet to be born. “It is this spirit – of religious freedom, of the impact of education, and of fighting for one’s values – that the Carroll family symbolizes so profoundly. These are foundational values for our state of Maryland, and of course for France as well,” Rutherford said. The opening ceremony for the chapel restoration was not just to commemorate “an important family, or an important time in both of our histories,” he said. “It is also a rededication of our commitment – the U.S. And France, Saint-Omer and Maryland – to these values. “Nearly 300 years later, times seem no less turbulent. It is more important than ever for us to focus on the free exchange of ideas,” the lieutenant governor said. Mayor François Decoster of Saint-Omer, said at the opening ceremony that the chapel, with its extremely vertical walls and highly luminous space, was the epitome of Jesuit spiritual and classical education. “Daniel and John Carroll and their cousin Charles came here because knowledge and education were valued,” he said. In his remarks at the event, Archbishop Lori noted that though this was his first visit to the town, he was touched with emotion to think that this was the place that was so formative in the life of his first predecessor as archbishop of Baltimore. The Carrolls represented just a few of a number of young men who were sent from Maryland to receive their education at St. Omer, the archbishop noted. “As subjects of the British Empire in the 18th century, they were not free to practice their Catholic faith. Among the laws enacted to suppress the Catholic Church during this period was one that prohibited Catholic schools. “It’s for this reason that families such as the Carrolls made the sacrifice of sending their children abroad for their education, with the full knowledge that they might never see them again,” he said. Archbishop Carroll recognized that one of the greatest needs for the Catholic community in his new diocese was schools, making one of his first major initiatives the establishment of Georgetown University. 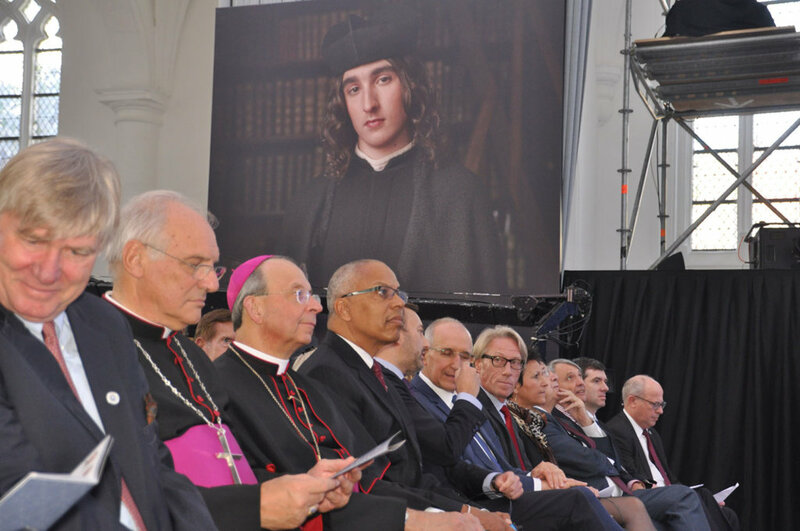 “When drawing up plans for the college, it is clear that he modelled the program after St. Omer,” Archbishop Lori said. Among the many other speakers at the opening was John Browne, headmaster of Stonyhurst College in Lancashire, England, which traces its lineage directly to the College of English Jesuits in Saint-Omer, founded in 1593. The school moved to Bruges, Belgium, in 1762, to Liège, Belgium, in 1773, and then to Stonyhurst in 1793. Browne noted that this lineage makes Stonyhurst the oldest Jesuit school still in existence. 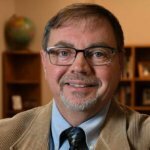 “Today, more than 1 million people attend schools founded by Jesuits around the world.” The schools help people to stand up for what they believe and for their faith, Browne said. The evening before the chapel opening, an exhibit, “The Jesuit School from Saint-Omer to Washington,” opened in the nearby Sandelin Museum. The exhibit, which will be open until Jan. 14, 2018, includes many artifacts brought from Stonyhurst, curated by Jan Graffius, Stonyhurst archivist. In a tour of the exhibit, she noted that the main plank of the education at Saint-Omer was the classics, taught in Latin, Greek and Hebrew. The school was designed mostly for lay people, not necessarily those considering becoming priests, as John Carroll did. Most of the boys came from England, where Catholic schools had been outlawed. Graffius related a story of the time the students sang the Ave Maria in 20 different languages. At the end, they sang, “Ora pro Anglais,” Latin for “pray for England,” drawing tears from the audience – and from some of the students. 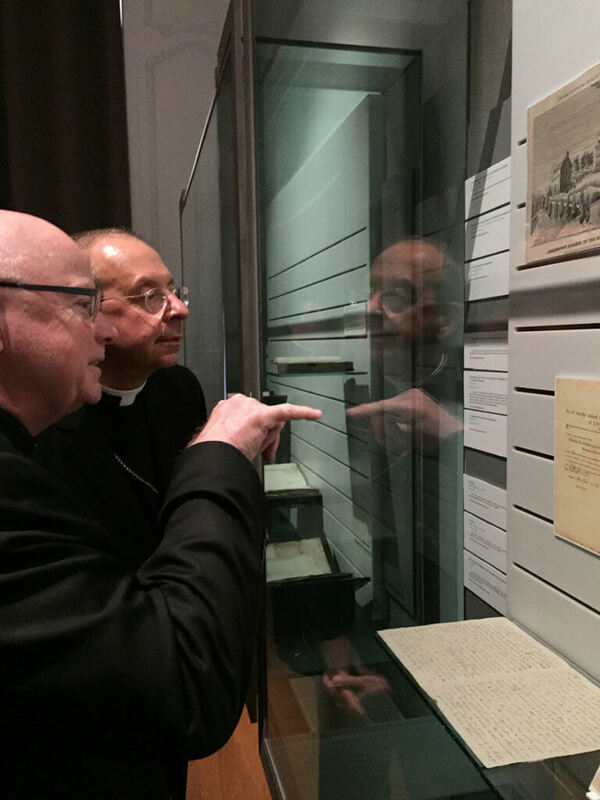 The exhibit includes articles of practical Catholicism, such as prayer books and missals. Since they could not practice the faith in England, their first experience of Catholic Mass was at the school where they had to be taught how to attend Mass, not just how to say the prayers but also how to sit still, etc.